During the week of May 14 to 21, educators, researchers and others with an interest in STEM will have the chance to review videos on the dozens and dozens of educational projects funded by the National Science Foundation and other federal agencies. 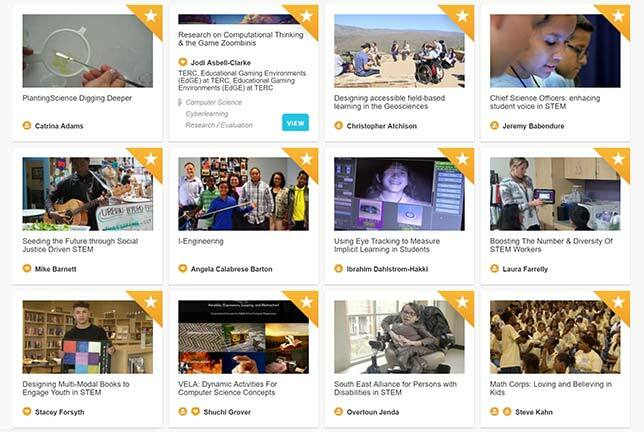 The Stem for All Video Showcase is inviting those engaged in federally funded projects that are focused on improving science, technology, engineering, math and computer science to submit short videos profiling their projects and then hang out online, discussing their projects with others, including teachers and the general public. Each year the showcase hosts between 100 and 200 video presentations, none longer than three minutes. A forum function on the site allows for public discussion among the researchers, practitioners, policy makers, members of industry and other interested people. The videos can be filtered by name, subject or keyword, grade level, audience type (such as K-12 vs. higher education), institution, state and other criteria. Andee Rubin, a senior research scientist at TERC in Cambridge, MA, who shared a video on her project, Math in the Making, in last year's showcase, said she participates because she'll end up "virtually hearing from people and meeting people that I wouldn't otherwise bump into." Likewise, she added, even though the showcase discussions last just seven days, making the video itself turns out to be "worth every minute you spend on it, because it communicates so effectively and it's so usable in so many contexts." In her case, she can send it to teachers she's working with, use it in workshops, even show it "on planes, just because I have something that's very easy for people to understand in three minutes the essence of the project." Michael DeGraff, a linguistics professor at MIT and director of the "MIT-Haiti Initiative," posted his project during the 2015 showcase, the first one held, and was astonished at the attention his work received. "As an academic, it was the first time that I produced anything in my career that got such a wide readership," he said in a video about the program. "Can you imagine thousands of views in a few days?" Research on STEM learning and teaching. Those interested in submitting their videos must register their expected participation by mid-February. Videos must be submitted between March 15 and April 25. The online showcase opens on May 14. Submissions also have the opportunity to gain wider recognition through three types of awards: facilitators' choice, presenters' choice and public choice. "The showcase provides the opportunity to learn about related work in the field, to make new contacts and collaborations, to hear from audiences interested in using project resources, to receive new ideas and feedback and to broadly disseminate innovative work," said Joni Falk, principal investigator of the showcase and co-director of the Center for School Reform at TERC, in a prepared statement. TERC, which manages the event, performs research, consulting and curriculum development for math and science.